Another week down and Baby Girl is the size of a Florida Pomelo. Should I know what this is, or am I a terrible Floridian? At my appointment on Monday, they told me she is 3 pounds 5 ounces! I'm getting bigger, and although I CAN reach my toes (if I try really hard and contort myself in weird ways), I just avoid it when possible. Mom and I went to get mani/pedis the other day and I'm glad I finally broke down. On my time hop it popped up that this was basically the exact time I gave up with Ella so "yay" for making it just as far! Look at this view, I took this photo of my lap in the car the other day. I've gained 26 pounds this pregnancy, which is basically where I'd like to be at this point. My challenge group started this week and I'm feeling really good! It's so nice to have the extra incentive and motivation because more than usual, it's tempting to eat junk and lay around. It's hard to lay around when you have a child as active as Ella, and as far as junk there really isn't much in my house but you find ways. I'm definitely finishing this pregnancy out on track though! I've traded in some of my now "too tight" tank tops for long flowy tanks. The majority of them aren't maternity, just whatever I've dug up from Marshall's and TJ Maxx. I hope to be able to live in them from now on, a few are work appropriate. OMG, I go back to work on Monday! Eeeeek! I'm going to channel all the energy I can over these upcoming weeks. Starting a school year while pregnant is not ideal, but I've done it once before with all of the Middle School scheduling chaos at my last job, surely I can do it again!!!! I'm as mentally prepared as I can be! This is what my plan is for the next 7ish weeks (I'm really 33 weeks right now)! It is JUST. SO. HOT! These past two days have been super busy. Stephen took Thursday and Friday off of work so we could do some fun family things. We went to Sky Zone, to see Finding Dory (Ella's first movie), and to the Orlando Science Center. I've been on my feet a lot but I'll be taking it REAL easy this weekend. Family is in town to visit my parent's new house and I'll be lounging around whenever possible. Also, I'll be getting a lot of pool time in. I have probably not been in the pool as much in the past year as I have been in the past week. Ella is learning how to swim a little bit with her puddle jumper and we are able to stay in the pool much longer than we used to. With the craziness of the move, I didn't get her into swim lessons this summer like I originally wanted to, but we'll get there! Swimming has been awesome exercise though, and really helps with my circulation. The veins are in full force! Here's a peek of Sko Dos's little face. I can't wait to kiss those lips! 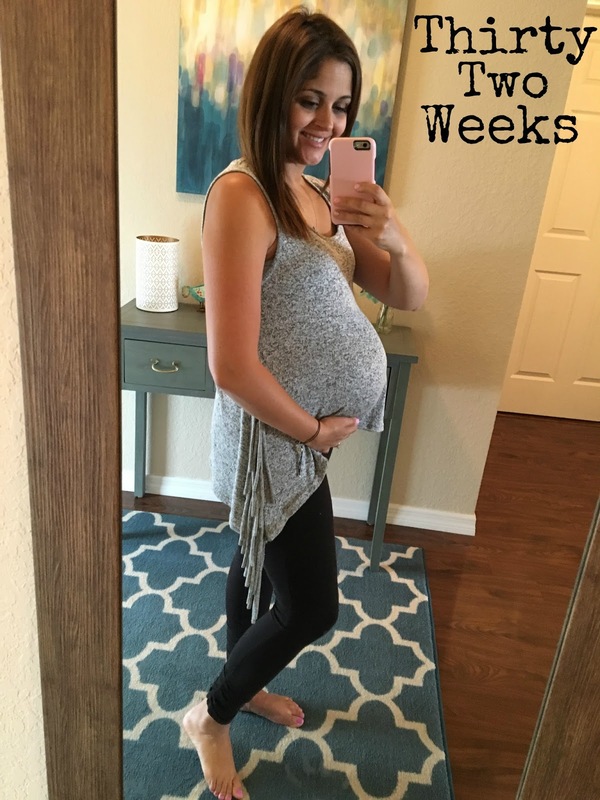 Click HERE to check out 32 weeks with Ella Rose!